Fitbit Versa vs Apple Watch: Which Model To Buy In 2019? It is no secret that the smartwatch industry is thriving in 2019 and this guide is designed to help clear the air to inform consumers about a common struggle between buying a Fitbit Versa vs. Apple Watch (Series 4). Boasting two of the most popular smartwatches at this current time, our team will dive deep and cover the two models over various criteria to help you determine the best model for your specific needs. We've given you a quick summary of each model below for the TL;DR (aka too long, didn't read) crowd. If you scroll past the condensed version, we will go much more in depth into the various criteria sections giving you valuable information that will help you better decide which smartwatch model is best for you. The first smartwatch from Fitbit after their acquisition of Pebble, this health-focused wrist device offers a simple execution with un-matched battery life. Additionally, this model supports both major smartphone operating systems (Android and iOS). Apple's latest and greatest iteration of their popular smartwatch, the Series 4 model touts some truly advanced smart and health features. Limited to iPhone users only, the Series 4 is also the most expensive smartwatch (at a base cost) that the company has produced and the most advanced. One of the largest determining factors for any prospective consumers who are looking to purchase a particular smartwatch will be the price of the device. In this case, neither of the two models would be what some consider cheap, but they differ significantly in the overall costs. 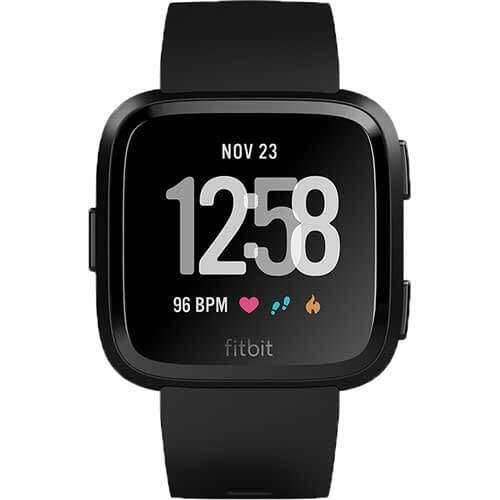 When the Fitbit Versa first launched back in March of 2018, the smartwatch had an MSRP of $199.95 for the base model of $249.95 for the limited ‘special edition' model. The special edition model is nearly identical to the base option yet it includes a sleek woven watch band and built-in NFC support for Fitbit Pay. Since then, the price of the Fitbit Versa has gone down considerably at major retailers especially during holiday promotions. Many major retailers were selling the base model for $149.99 during Black Friday/Cyber Monday shopping holidays and Amazon is currently selling it for $199.95. Considering the feature-set and performance of the Versa, we think the current selling price is well-warranted. While true that it doesn't live up to the overall feature and quality standards of Apple's Series 4 smartwatch, but at less than half the price, we don't expect it to. Apple's now on its fourth generation of their popular smartwatch, and this is the first smartwatch model that many people decide to buy. 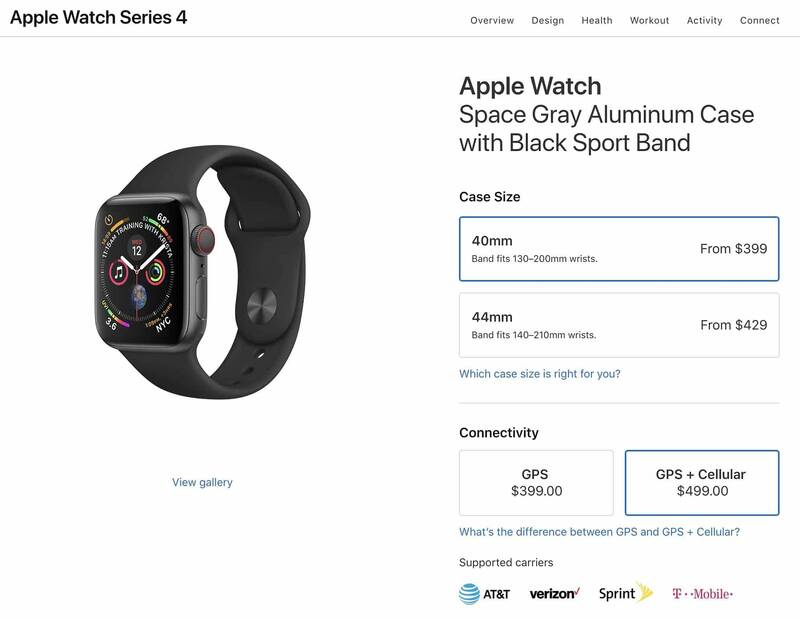 With the launch of the Series 4, the Apple Watch has increased in price for both of their size options: the 40mm (ideal for females or smaller wrists) and the 44mm (best suited for men or larger wrists). These latest generation models now have an MSRP of $399 for the base ‘Sport' model in the smaller 40mm sizing and the same base model in the 44mm variant retails for $429. 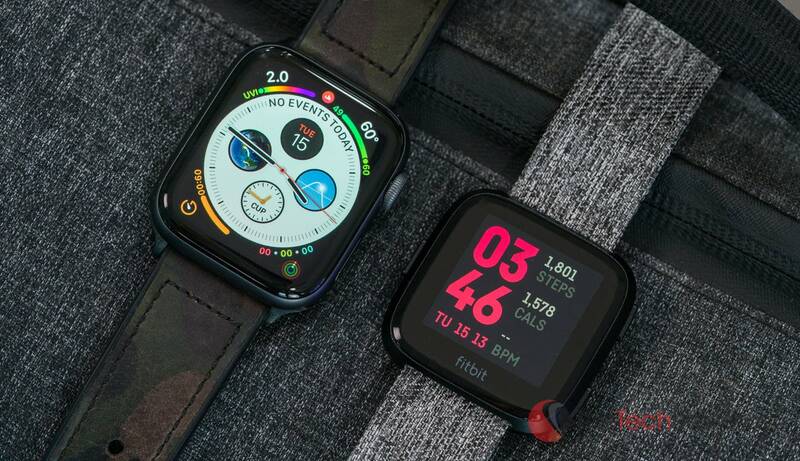 Both of these models are made of aluminum and offer standard watch bands with native support for GPS connectivity only. 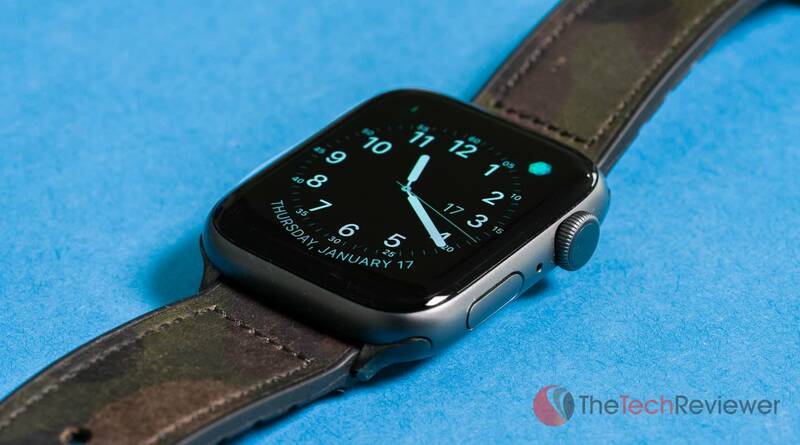 If you want to upgrade to a higher model that utilizes more durable build materials, a fancier watch band or even native LTE connectivity then you can spend much more than the base models with the stainless steel versions starting at $799 and the Hermes Edition Apple Watches starting at a staggering $1,249 (and reaching as high as $1,499). Due to the affordability of the Fitbit Versa which is sold for less than half of an Apple Watch, the Versa takes the take here. Keep in mind, that while the Versa is significantly cheaper, there are clear reasons why it is cheaper when you compare the build materials and features against an Apple Watch. When buying a new gadget such as a fitness tracker or smartwatch, a lot of consumers will want to know how soon the device will be replaced with a newer, better and sometimes cheaper model in the line-up. Below we will be calculating the average sales cycle of the Fitbit and Apple smartwatches, but this doesn't equate to the lifespan. Just because either manufacturer stops selling a model due to a replacement with a newer, better model doesn't mean the old versions won't last you more than the sales cycle for prolonged usability. This is the first generation of the Versa smartwatch from Fitbit, so it isn't the easiest to touch on its life cycle. However, in the past Fitbit has released another smartwatch dubbed the Ionic which was the predecessor to the Versa. Adding up the limited data we have on previous releases, we can make an estimation that the average sales cycle of a Fitbit smartwatch is: 18 months or 1.5 years. First launched back in 2015, this is the fourth iteration in the line of smartwatches from Apple and the first major redesign. Initially, the Apple Watch launched in the Spring, but now Apple has seemed to make it a tradition to announce a next generation smartwatch in the fall alongside their new iPhones in September. Adding up the data based on the previous releases, we can make an estimation that the average sales cycle of an Apple smartwatch is: 10.25 months. While the data is limited in Fitbit's case, so far they are spacing out the releases of their smartwatches to allow plenty of consumers to enjoy their models before replacing them with a better version. Apple, on the other hand, is in the habit of replacing their smartwatch model within 10 months on average. However at this point in the Apple Watch, it seems to be a new version every September. Another important area to consider in the Apple Watch versus Fitbit Versa debate, the size and design will ultimately play a major role in your day to day use of the smartwatch. Though similar, these two models have some distinct differences in this area. Being the first model that Fitbit released after their acquisition of Pebble's company assets, the company chose a basic design much like the Pebble 2 with a more refined, sleeker and thinner chassis. Measuring in, the Fitbit Versa comes in at 39.35mm by 39.35mm with 11.2mm in thickness. The design offers a touchscreen display mixed with three tactile side buttons with one on the left and two on the right. Due to the combination of both the buttons and the touchscreen, you are able to easily navigate through the various interfaces with just a little practice. While the screen is rather large at 1.34″, the actual pixel dimensions are 300 by 300 pixels. This results in some rather large bezels around the screen which frankly aren't pretty. The background of the UI is primarily dark, so fortunately this helps you from not noticing them much. This is the first generation of the Apple Watch that has changed significantly in size. Most of the size changes happened in the width and height of the screen compared to previous generations, but there is a slight reduction in thickness as well coming in at 10.7mm thick. The Watch itself isn't much larger on the wrist, but instead, they were able to stretch the usability of the display farther to the edges of the chassis thus lowering the bezels and giving you more screen real estate in a smaller form. The 44mm option now has a resolution of 368 by 448 pixels (compared to the previous generation's 390 by 312) and the 40mm sizing has a screen resolution of 324 by 394 (previously 272 by 340). 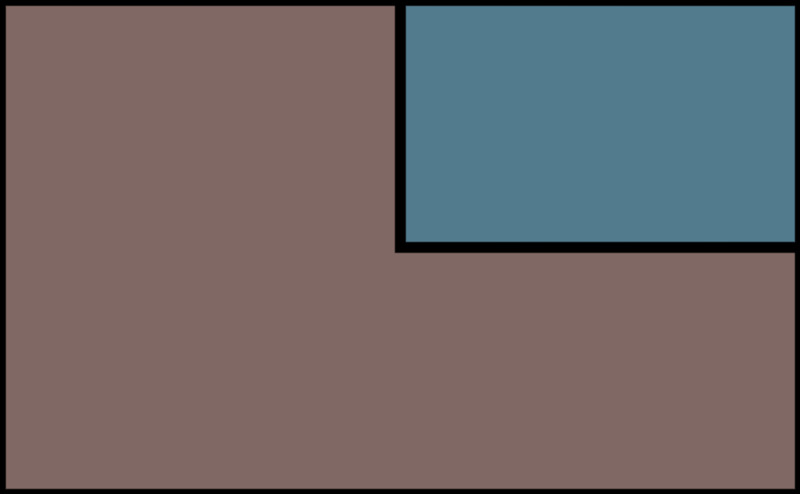 Sold in both 44mm and 40mm size variants (compared to 40mm and 38mm in the past), the difference between the two models merely has to do with the screen size and the capabilities between the two models are identical. In most cases, the larger 44mm sizing is best for male users or consumers with a large enough wrist whereas the 40mm is more recommended for female or smaller wrist users. Unlike the Fitbit Versa, the Apple Watch only has two buttons on the right side and relies on most of its interaction to be done through the touchscreen versus the side buttons. While we love the feel of the three tactile buttons on the Fitbit, Apple's thinner casing mixed with a larger, more pixel-packed display (with thinner bezels) and two potential size options give them the edge in this area. Nowadays build quality often is one of the largest elements to consider when purchasing a consumer electronic that you hope will last you years of use. In many cases, the cheaper models will suffer from build quality downfalls while the premium models will utilize higher-end, more durable build materials. Given the price of the Fitbit Versa, you'd think the build quality would be sub-par. After owning the previous Pebble 2 which had a notably cheap feel, we weren't expecting much. Surprisingly enough, the Fitbit Versa has much better craftsmanship than expected for the sub-$200 price-point. The chassis of the Versa is made of anodized aluminum which feels durable while still remaining lightweight. The front screen is comprised of Corning Gorilla Glass 3 which makes it more robust and durable than standard glass. On the rear, the charging contacts are made of brass surrounded by plastic. On each side of the Versa, the integrated buttons are also made from the anodized aluminum, and they have a nice, tactile feel without the mushy experience that you'll often see at these lower price-points. The Versa is water-resistant (up to 50M) and can be used in wet environments such as a shower, rain or pool without any issues. Priced at a much higher premium than the Versa, you'd expect the Apple Watch to blow it out of the water when it comes to build quality. This isn't the case interestingly enough as the base aluminum body has a very similar feel especially when you compare the two models with the standard sport band, side by side. 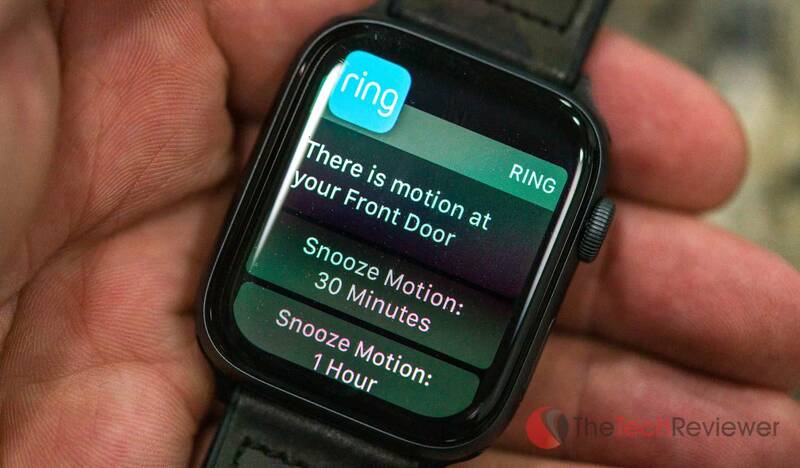 The Apple Watch's side button and digital crown have a solid tactile feel to them as you scroll or push the buttons. Base model Apple Watch Series 4 will utilize their Ion-X glass which is designed to help prevent scratches. 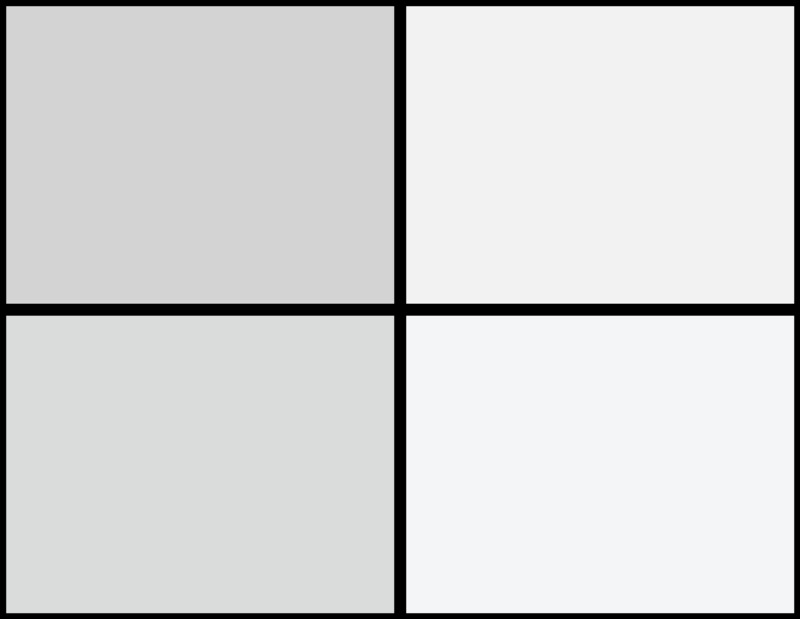 If we wanted to be nitpicky, we would probably say the Apple Watch base model has a slight advantage in the build quality department. However, as soon as you step up to the stainless steel model this build quality advantage widens significantly due to the increased durability of both the chassis and the Sapphire display. 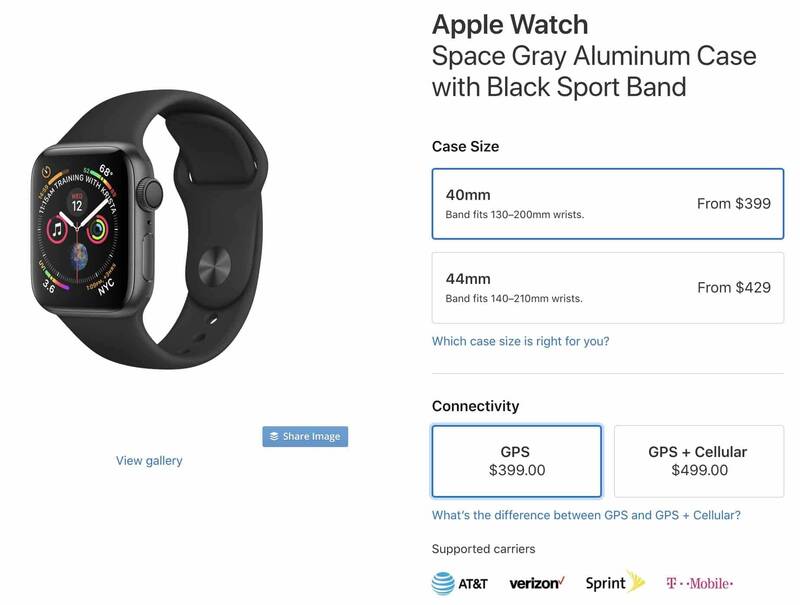 With that being said, we don't necessarily think its a fair comparison to put a sub-$200 Fitbit Versa against a $699 Stainless Steel Apple Watch Series 4. In this case, the Stainless Apple Watch will take the cake in build quality every time, but at the base model, the two are closer than you'd expect. Similar to the Versa, the Apple Watch Series 4 is water-resistant up to 50M and can be used in shallow, wet conditions without any issues. Apple's Watch Series 4 barely takes the cake here at the base model level, but as soon as you step up to the higher-end Stainless Steel model, then it becomes no comparison when matched against a Versa. With that being said, the Versa is well-built for the affordable price, and we see no potential long-term issues in build quality between either smartwatch. Whether or not you have an Android or an iPhone will be a critical factor to consider when choosing between these two models as only one of the two smartwatches accepts use with Android smartphones. Designed independently from both Apple and Google, Fitbit has created their Versa smartwatch to be cross-platform ready. This means that it can connect and operate when paired with both an iPhone or an Android smartphone. There may be some minor limitations when paired with an iPhone over Android as Apple is more constrictive with their operating system, but for the most part, the experience will be the same regardless of which smartphone that pair with it. Since the Apple Watch is designed and manufactured by Apple, they have limited the support for smartphones to only work with compatible iPhones. If you own an Android smartphone, you will not be able to pair your device with the Apple Watch, and the majority of the smartwatch's capabilities will be severely limited. Due to this, we would NOT recommend buying an Apple Watch (Series 4 or even a prior generation) for yourself or anyone who owns an Android smartphone. An easy win for the Fitbit Versa which supports use on both Android and iOS. Apple Watch users remain locked to iPhones only thus removing the Apple Watch potential from any prospective Android users. Some consumers love being able to customize their smartwatch both digitally and with accessories like aftermarket watch bands. The Versa allows you to change the watch faces via the Fitbit app. Most of them are free, but some of the more intricate ones will require you to purchase a license which typically goes for a few bucks. 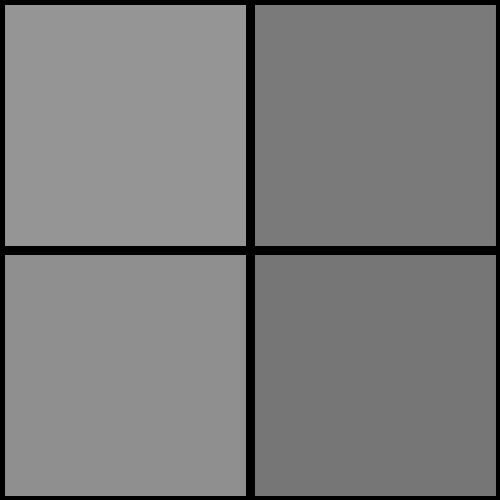 Keep in mind, some watch faces can negatively affect battery life (we will get into this at a later section). When it comes to the watch band, the stock rubber one isn't the most comfortable or stylish option, but you can purchase an aftermarket band through Fitbit or on Amazon for relatively cheap. 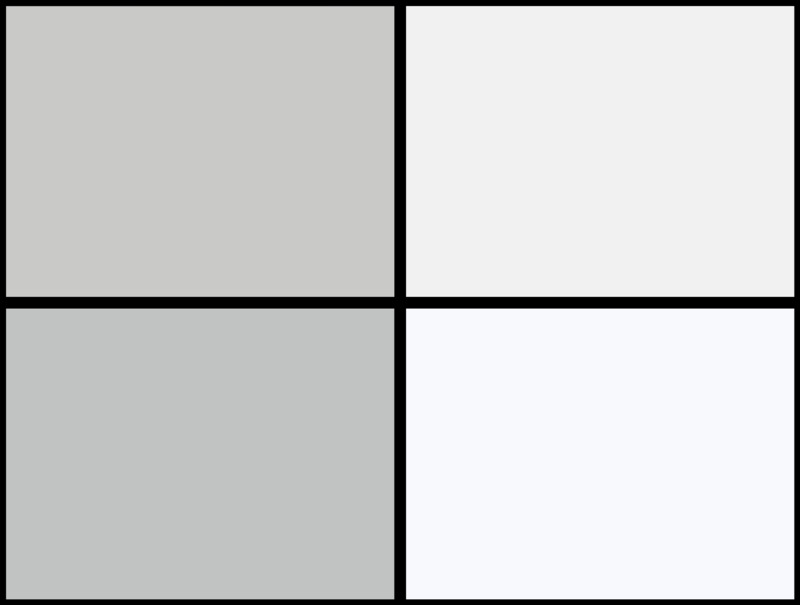 These bands come in a variety of looks and built materials, but the overall selection isn't vast. We chose a basic canvas band off Amazon for $10 to replace our stock rubber band and it is surprisingly nice for the cheap price. The larger size of this band fits my wrist better than the ‘large' stock band and it looks decent in person, closely resembling the canvas band that is included with the Versa Special Edition. The Apple Watch iOS app has a lot of customizability within it allowing you to change watch faces, edit app layouts, customize text size and edit notifications. Depending on the watch face that you choose, you may be able to customize certain aspects to showcase different data points that you would like such as temperature, date, remaining battery percentage, UV index, heart rate, etc. There are third-party watch face apps within the WatchOS app store (both free and paid), but frankly, Apple provides enough free official watch faces that I don't find the need to look anywhere else. We really like the watch faces that are animated sequences and the ability to upload your own photos to become the default background for the watch. When it comes to the ability to customize the watch band itself, Apple offers a ton of different build materials and colors through the Apple Store. There is also a huge assortment of aftermarket bands on Amazon that you can score for cheap that are decent quality. The one seen in our photos is a hybrid sports band from Amazon in a camo finish which I think looks pretty sleek and was only $25. It isn't the highest quality band around but well worth the low investment to replace the dull sports band in the black rubber ‘sport' finish. 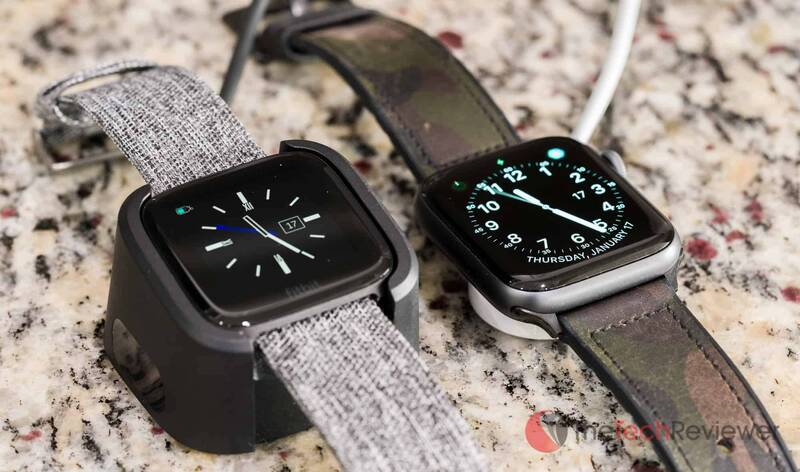 While both models offer customization both digitally and via interchangeable watch bands, the Apple Watch wins this category due to the influx of quality watch faces directly from Apple that is highly customizable. 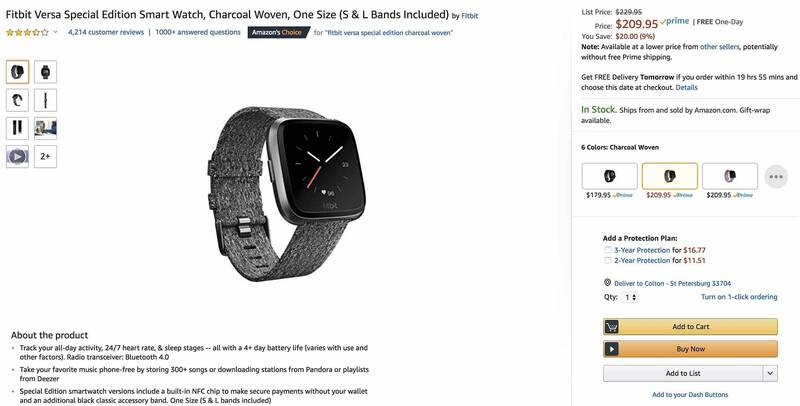 Additionally, Apple sells a variety of official watch bands as well as the vast assortment of unofficial watchbands on marketplaces like Amazon. Not always huge factors for the average consumers, but the addition of support for newer wireless technologies such as LTE, GPS and NFC are areas that some prospective buyers may be curious about with each smartwatch model. The Fitbit Versa at a base model offers no native support for LTE, GPS or NFC (aka near field communication). This is likely due to the lack of necessity for most consumers at this price-point. However, they can pull a GPS signal via your smartphone for related applications or fitness tracking. While this works for some users, it won't be good enough if you wish to go for a run or bike ride with the Versa equipped, but want to leave your smartphone at home. There is no way to enable LTE support in any way on the Fitbit Versa. 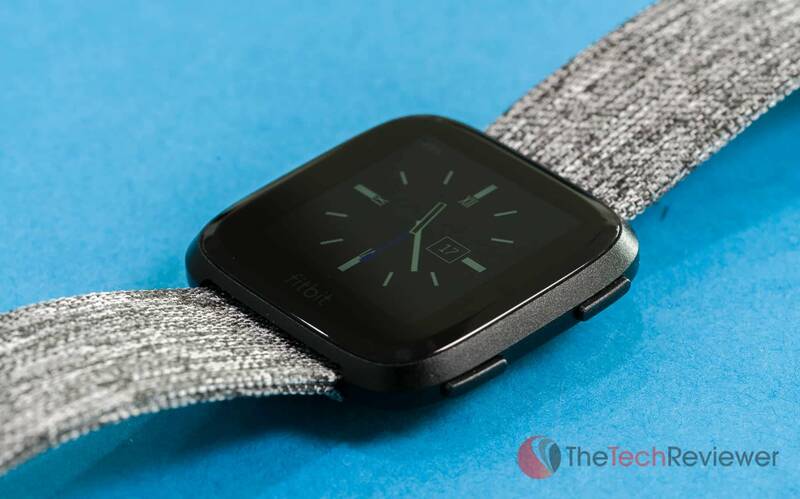 NFC can be found on the Fitbit Versa Special Edition which sells for more but includes native NFC connectivity and support for Fitbit Pay, a hands-free payment processing service used by some retailers and banks. Depending on the Apple Watch Series 4 model that you purchase, you'll gain access to LTE, GPS and NFC. By default, all Apple Watch Series 4 models come with their own GPS and NFC support. This means that you can take leave your phone at home while still tracking your GPS location or make hands-free payments via the now widely supported Apple Pay. If you opt for the higher-end LTE models, then you'll gain the ability to receive and make phone calls/texts while on the go without your smartphone. However, this comes at a price beyond the higher device cost as you'll need to subscribe to an LTE plan which averages around $10 a month in subscription costs. With support for LTE, GPS and NFC on their higher-end models and 2 out of the 3 on their base model, Apple's Watch Series 4 takes the cake in this section reining supreme over the Fitbit Versa's lack of all three options at the base model (adding NFC on their higher-priced special edition smartwatch). One of the most important factors to many people is how long the smartwatch will last for use on a single charge. Keep in mind, the actual battery life can differ from person to person depending on your direct usage, installed applications and preferred screen brightness. In the marketing materials, Fitbit states the Versa has a 4+ day battery life which will depend on usage and other factors. From our hands-on experience, we have been getting around 5-6 days of use on a full charge. This is while utilizing the full heart rate tracking, sleep tracking and text message notifications on a day to day basis. We did notice from our testing that certain Watch Faces can have a dramatic effect on the outcome of the battery life. Our personal preference is a simple one called ‘Stats' made by Fitbit which seems to utilize the power consumption well enough to extend the battery life longer than advertised. However, we have experimented with several watch faces made from other developers and found that a few of them that though attractive to look at with sleek, colorful designs will drain the battery by up to 50% over a 24 hour period which is not ideal for prolonged battery life. 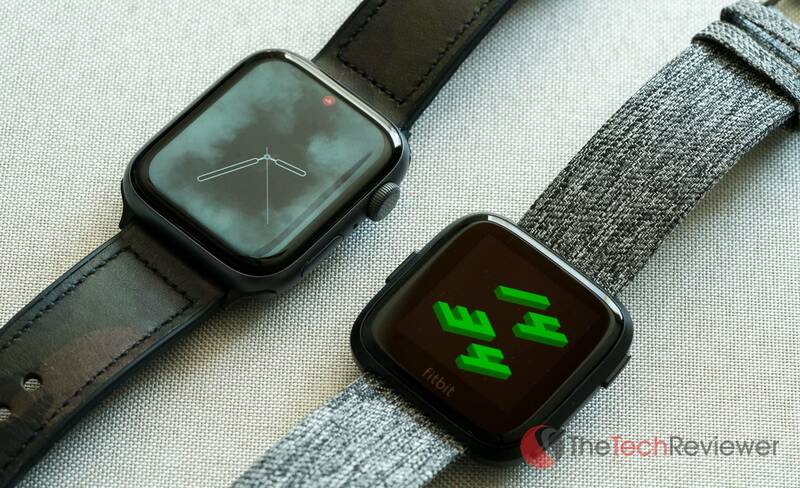 Ever since its launch, the Apple Watch has struggled to maintain any competitive benchmarks concerning battery life, and it falls tremendously short in comparison to the Fitbit Versa. Apple has rated it officially in their marketing materials to offer up to 18 hours of battery life which is based on 90 time checks, 90 notifications, 45 minutes of app use and a 60-minute workout with music playback over Bluetooth. 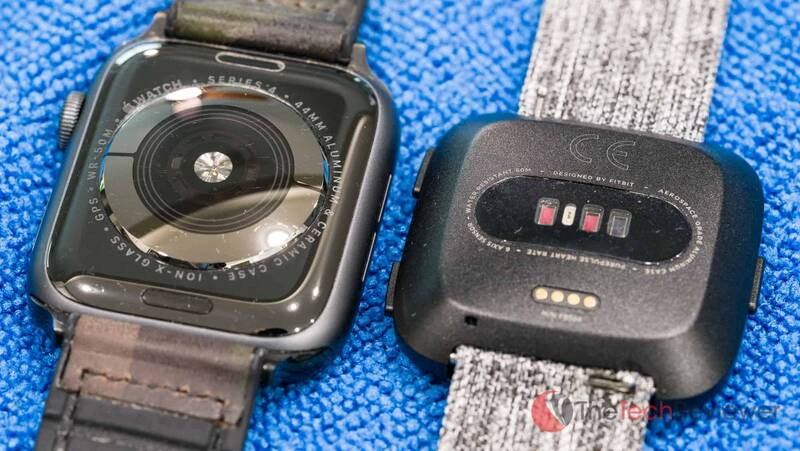 If you are planning on utilizing the Watch for its talk functionality for making or receiving phone calls, then the battery life will dip significantly more with only 2 hours of talk time when connected to your iPhone or 1 hour when connected to an LTE connection. In our experience, we have seen about 24 hours of battery life through day to day use although this includes taking and leaving the Apple Watch off our wrists overnight (though not charging). 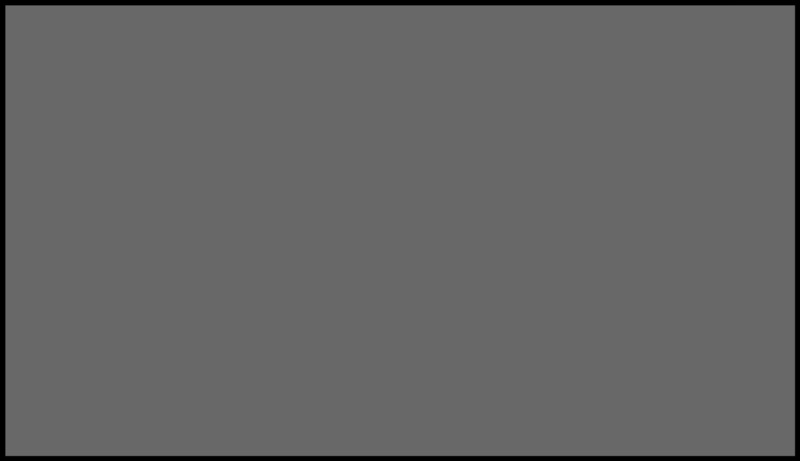 During this time we did not utilize the talk feature when receiving or making any phone calls. With all the third-party notifications, integrations and advanced features of the Apple Watch, your battery life can vary significantly from user to user. However, as a general rule of thumb with being an Apple Watch user is you should expect to have to charge it each night if you want to utilize its functionality all day. This removes the ability to track sleep through a third-party application which our favorite feature found natively on the Fitbit Versa. The Fitbit Versa utilizes its integrated battery capacity in a highly efficient manner thus allowing for 4+ days of advertised battery life and more like 5-6 days from our testing through regular use. With the Apple Watch Series 4 falling so short in battery life, this makes it a notable burden. 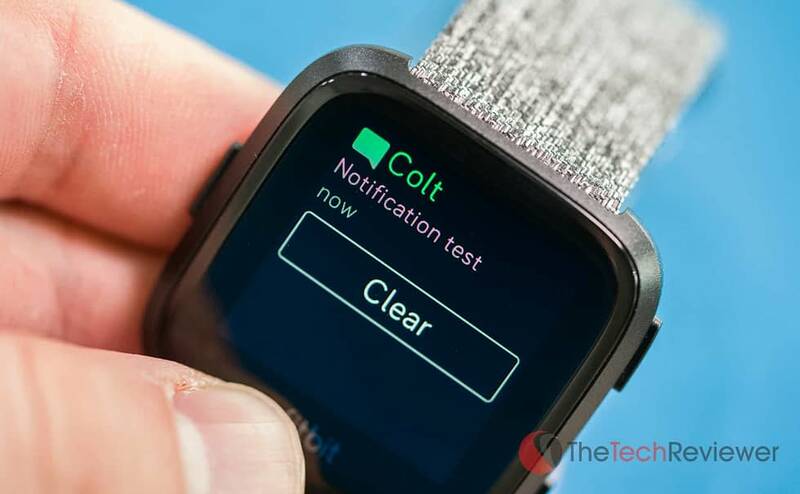 A big reason people purchase a smartwatch is to remove the close leash to their smartphone and instead receive their notifications directly to their wrist. The Versa from Fitbit allows you to receive basic notifications through SMS. iMessage or phone calls. When it comes to third-party notifications (such as Facebook, Instagram, Snapchat, Twitter, etc), you can enable them manually in the Fitbit app to receive simple notifications for supported services. Once in a while, Fitbit will send their own notifications to you based on things like your activity levels, step count and heart rate. To some, these will help to stay motivated throughout the day to stay active and stick to their goals while others may want to disable them. Much like the previous generations of Apple Watches, you can utilize the Series 4 to receive notifications from virtually any third-party application on your smartphone including Facebook, Snapchat, Instagram and Twitter. You can also change the notifications to show on only on your watch, but not your phone, have them show up on your phone but not your watch or have them display notifications on both devices. Keep in mind, just because there are notifications for third-party applications, this does not always mean that there are full-fledged third-party apps available on the Apple Watch and in most cases, you'll still need your phone to receive full functionality of the app or service. Similar to the Versa, the Apple Watch will by default send you occasional notifications regarding your fitness/activity levels for the day, and it will also tell you if you've been sitting for too long and whether you should take some time to stand (it recommends once an hour during the day). Both devices are capable of providing call, text and third-party notifications for major apps and services. Additionally, they will both give you occasional fitness notifications throughout the day to stay in line with your health goals. While the screens on a smartwatch are rather small, a lot of well-known online services have developed third-party applications that are able to run natively on these wrist-worn devices. Given the nature of the device and the lack of bells and whistles when compared to the Apple Watch, there is not a lot of support for third-party applications with the Fitbit Versa. This mainly due to the lower amount of overall Versa owners compared to four years of Apple Watch sales. Given the time commitment it takes to create and maintain a mobile watch app, most companies choose to build apps for only the most popular wearable platforms. It is worth noting that just because an app for third-party services is present, doesn't mean that it's made by that provider. Most of the applications on this Fitbit App Store are made from miscellaneous developers. For example, the Spotify app isn't actually developed by Spotify, but an independent developer named Elliot who is found a way to control Spotify through the Versa. The Apple Watch has been in existence since 2015, and there have been an estimated 33M units sold to date. This means there are a MASSIVE user-base and harnesses a lot of potential for third-party services or developers to create native WatchOS applications. Chances are if you are utilizing any major service or trying to achieve something that could be easily accomplished through a smartwatch app, then an app will be already created and available with the Apple Watch store. Our favorite uses of the Apple Watch's third-party applications is for sports use such as ‘Fun Golf GPS' which allows you to see accurate yardage information on your favorite golf courses as well as keep score all from your wrist. The sheer size of the Apple Watch community has allowed the device to gain the attention of many major companies or individual app developers. This has driven an influx of both paid and free applications for virtually any need or desire within the Apple Watch App Store which far outweighs the application support for the Fitbit Versa. If you are going to be utilizing a smartwatch during exercise, then chances are you'll also be listening to music during this time. Having the ability to control your music (such as play, pause or skip) or even play music from your smartwatch alone without the need for a smartphone is convenient. The Versa has 2.5GB of built-in storage meant specifically for music which equates to about 300 songs. Music can be added by connecting the watch to your Mac or Windows computer and utilizing the Fitbit Connect app. For those who don't want to go the manual song transfer route, you can utilize Pandora or Deezer to listen to your music, but both require a paid plan (Deezer had a 90-day free trial and Pandora has 30 days free of premium). Keep in mind, while this offers smartphone-free listening, you'll need to sync the songs/stations/playlists ahead of time before ditching your phone for a workout. If you don't mind lugging your phone around for your workout (in the case of going to the gym versus for a run) then you can control your smartphone's music when connected via Bluetooth by holding down the back (aka the left) button which will give you a quick options panel to switch songs or pause/play with the song's title and artist. In our testing case, this worked when streaming Spotify from our iPhone XS Max. The Apple Watch (Series 3 or later) on the other hand allows you to access your Apple Music library if you are an active subscriber. Siri-support is also included here allowing you to play your favorite songs via simple voice commands. If you don't subscribe to Apple Music (we prefer Spotify), you can still add Apple Podcasts to your Apple Watch which also works with Siri. If you'd manually like to sync music or podcasts to your Apple Watch for solo listening, this is also possible via the integrated 2GB of storage. Like the Versa, third-party music applications such as Spotify can be controlled via your Apple Watch with or without an official application. Spotify just recently released their own WatchOS app, but even without it you'll gain access to basic controls like pause/play and whether you want to skip or replay the previous song. Apple's native support for their Apple Music platform and the Fitbit Versa's compatibility with Deezer/Pandora make for a similar experience depending on which music platform you prefer. Additionally, both smartwatches offer basic control of the most popular music streaming platforms through your smartphone so we have a tie here. A lot of consumers utilize a fitness tracker or smartwatch to keep an eye on their activity levels throughout the day to help them lose weight and reach their health goals. Fitbit at its core is a fitness tracker as the company's roots were built upon this concept. 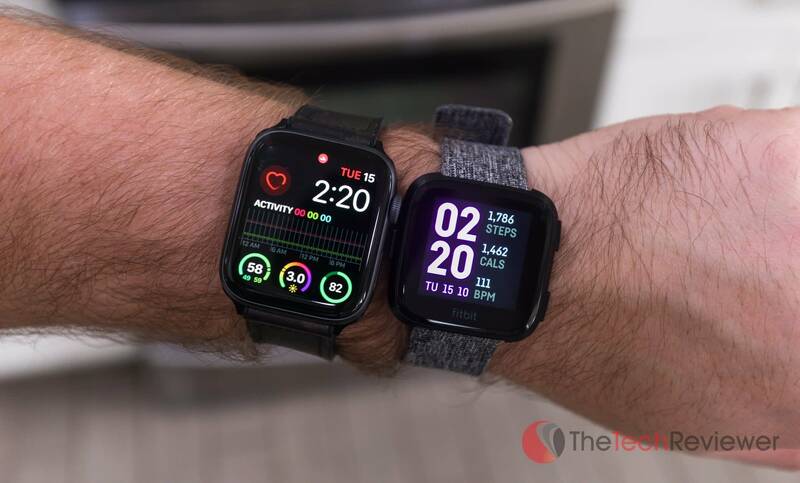 However, the Versa is one of their early efforts into the smartwatch market that does accomplish this well, but the core of its value comes from the activity tracking aspects. As you'd expect, the Fitbit Versa has 24-hour heart-rate tracking utilizing the company's PurePulse Technology. This allows you to track your heart rate continuously throughout the day giving you the ability to see critical health information like your resting heart rate, cardio/fat burn periods throughout the day and helps for accurate sleep tracking. Another cool feature is their cardio fitness score which basically takes all the big data behind your heart rate information and gives you a proper rating based on where your health is for your age/gender. This score can change over time as your fitness level increases, so it's a useful metric to track progress. When it comes to working out, you can enable the exercise mode. This will give you a workout-centric watch face that allows you to see all the vital information at a glance depending on the activity (there are 15+ exercise modes) such as calories burned, time elapsed, pace, mileage, bpm, etc. If you don't manually enable it, the Fitbit does have a way of manually tracking your exercise based on your heart rate rising for extended periods. From our experience the auto workout recognition isn't ultra reliable, but with the 24/7 heart rate sensor it isn't a huge deal if you miss a workout as your steps, heart rate and calories burned will always be calculated. There are also guided exercises to give yourself easy workouts which display the movements and then give you a timed period to carry out the reps. These guided exercises are pretty unimpressive and seem like more of a marketing gimmick than a practical feature, but we doubt most of you would use them anyways. Fitbit also advertises their female-specific health features on the Versa which includes period logging that allows you to compare your menstrual cycle against weight, sleep and activity level. Every iteration of the Apple Watch has had health tracking, but the Series 4 is the first generation to harness some of the advanced features. For example, in previous generations of Apple Watches any workouts that you wanted to track had to have been manually monitored at the start and end of your exercise. 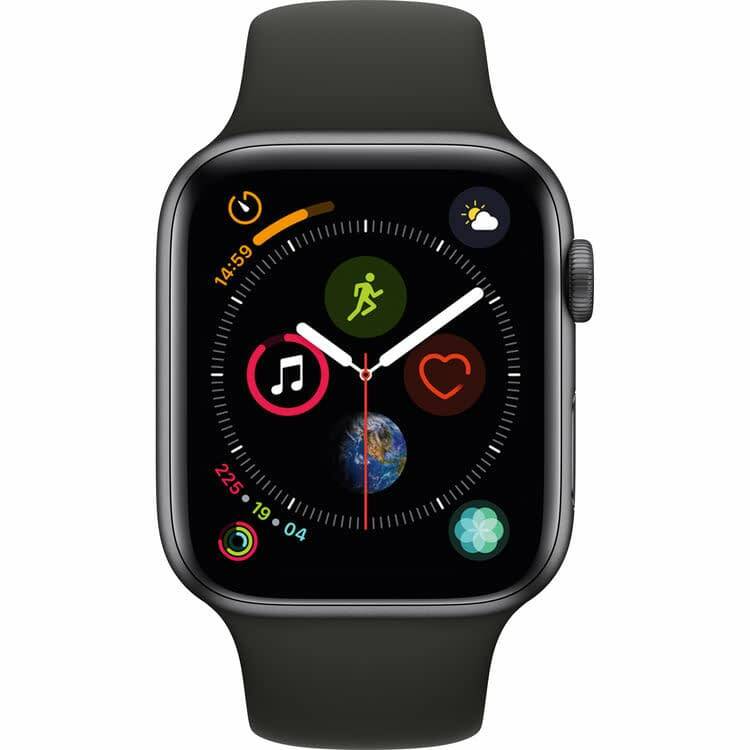 With the Series 4, they have added auto recognition for any strenuous physical activity although you can manually active it like in the past to achieve the best heads-up information on your particular type of workout. Beyond this, Apple added better heart rate tracking to this model (though not 24/7 monitoring unless workout mode is enabled) including the impressive ability to perform an FDA approved Electrocardiogram all through wearing the Apple Watch on your wrist. Using third-party applications, you can add future health features like menstrual cycle tracking, glucose tracking for those with diabetes or food/water tracking. This is a closer category than we had anticipated as Apple's newest ECG feature is really advanced and innovative. However, Fitbit's advantages are too strong with 24/7 heart rate tracking, a cardio fitness score, and built-in female health monitoring by way of menstrual cycle tracking. Last but not least, we have the sleep tracking feature which is a primary reason for many consumers to buy a Fitbit as they have boasted this capability for many years throughout their various generations of activity trackers. Thanks to the Versa's stellar 4+ day battery life, you are able to wear the watch consecutively overnight without the need to charge. The Fitbit operating system will automatically track your heart rate and movements throughout the next to determine your sleeping patterns. Depending on your heart rate, your nightly sleep will be categorized between awake, REM, light sleep and deep sleep. After the night is over, you are able to sync your smartphone with the Versa to achieve detailed graphs like the one embedded above. As time goes on, you can compare your sleep patterns from a day to day basis, 30-day average and also examine your sleep habits to the recommended benchmarks for others in your age/gender brackets. Sleep tracking is the primary reason why I purchased a Versa, and it has helped me try to get a grip on my poor sleeping habits through easy to understand sleep data to analyze trends and see what I can do to help me sleep better and feel more rested. Given the relatively poor battery life of the Apple Watch, there is no native sleep tracking functionality as Apple expects you to be charging your watch at night just like you would your iPhone. I am aware that there are some third-party sleep tracking apps for the Apple Watch, but the main issue comes in with battery life as it means you'll need to charge the device every morning before work or school which for most people just isn't convenient or practical. The Versa's stellar battery life and integrated sleep tracking functionality make it the clear winner versus the Apple Watch's poor battery life and lack of any native sleep tracking capabilities. At this point, we have covered all of the major bases and concerns about the Fitbit Versa vs. Apple Watch debate. Overall, the Versa slightly won more categories than the Apple Watch, and it is a great smartwatch for the price especially if you are health conscious or looking to improve your fitness/sleep routines. With that being said, the Apple Watch Series 4 is an elegant, well-crafted and highly refined smartwatch that benefits from the massive user-base when it comes to third-party apps and customization potential. The truth of the matter is there is no "one product fits all" type scenario in consumer electronics (despite what many reviewers or consumers will say), and this is a prime example. While I own an Apple Watch Series 4 and choose to wear the Versa over it on a daily basis, others may have a completely different preference. It is ultimately up to your personal needs, preferences and budget. Which Model Have You Decided To Purchase? We hope you enjoy our comparison guide for the Fitbit Versa vs. Apple Watch (Series 4) !